Through 2018, many of our investors may well have become bored listening to our endless repetitions of the warning that a market correction was “just around the corner”. In October, the correction arrived in all major markets: the US S&P500 price index has fallen by -8.8% so far this month, the Australian S&P/ASX200 by -8.7%, the Japanese Nikkei 225 by -11.3%, and the European Stoxx 600 by -8.2%. (The Chinese Shenzhen A dropped -10.3%, but it has been falling all year and is now down by -31.9% since January.) 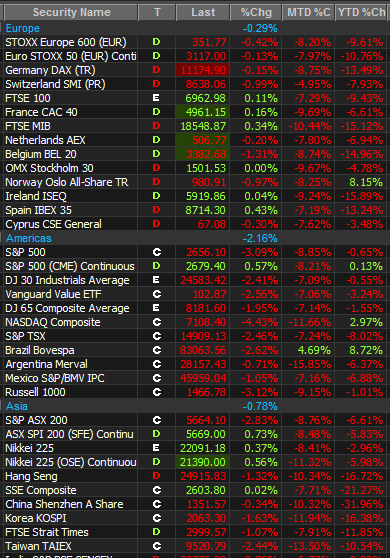 By the third week in October, all major country indices were now definitively in the red for the year to date. The painful truth is that corrections are a normal part of share market life. 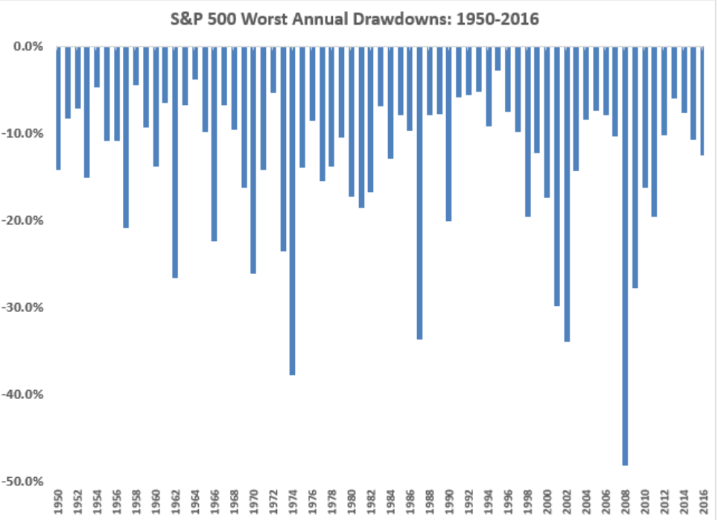 The chart below shows the worst intra-year drawdowns in the US market since 1950. Drops of -10% are common, and drops of -20% or worse occur about one year in four. To reiterate that point, since data has been collected on the US stock market, the statistics show 1 year out of 4 years there will be a drop in stock markets of -20%. Or worse. But the history of global share markets also shows us that markets bounce back. Corrections and bear markets are reasonable responses to adverse events, and they usually occur when markets are fully priced. In the long run, share markets go up steadily, unless a country has a revolution (e.g. China, Russia) or loses a World War (Germany and Japan). The US market illustrates this point most clearly because it is the best documented and most researched. Over the last ninety years, daily movements in the market are close to random: +54% up versus -46% down. But the S&P500 makes money three years out of four, and on a five-yearly basis it makes money 86% of the time. (The periods when it didn’t were all during the Great Depression of the 1930s.) Over a twenty-year period you would have always made money. In short, the best strategy if you do not need to touch a single cent of your money for at least 20 years, is to buy and hold. If you really want a decent return, invest for 100 years; the numbers look even smoother! The problem with the math vs existence, is that it is far easier to talk about 100 year average portfolio returns than it is to wait 100 years for the payoff. The long-term reason for holding equities over most other asset classes is very simple. In all major markets around the world, the long term returns from equities beat bonds and cash by a long way. The average annual return of the US market since 1900 is 6.5% in real terms, that is, after inflation. The equivalent return for the Australian market is 6.7%. That is why “buy and hold” is a strategy which you, the individual investor, can follow if you do not need access to your investment for multi-decade stretches. You can also follow “buy and hold” if you can stomach looking at your holdings statement of your share portfolio showing that you have lost somewhere in the region of -20% to -45% just about once a decade. This requires a particular level of intestinal fortitude from investors and most people (i) do not enjoy this feeling happening to them every 10 years without fail (ii) need access to their funds more than once every 20 years. Earlier this year, when Arminius first started warning of a correction, our models indicated that we were approaching one of those “1 in 4” periods when the US share market was expensive. Being a systematic quant fund, we followed our models and at the end of January took protection out against our US index position. We have made significant positive returns from our US holdings in October from following our models. However, we deliberately retained holdings of some long Australian positions, fundamentally valued because they are robust, dividend paying stocks. The probability that these companies will stop paying dividends even over a 1 or 2 year period is statistically very, very low. We model these value stocks on a longer-term investment horizon, which is different to how we would model a company or index we are looking to short, or purchase protection over. Remember, however, that the returns quoted previously in this article above relate to total market indices – they do not apply to your favourite tech stocks or the hottest lithium miners. Why are we mentioning “buying and holding” when we have been warning our investors about a correction? Because for most Australian share investors this correction will not be as bad as the GFC. So long as you don’t have to sell any of your shares in the volatile period ahead, your losses will be unrealised, and you should make the money back by (mathematically speaking) 2024. The average bear market in the US lasts only sixteen months, and the worst (after the 1929 Crash) lasted less than three years. Why? Because share markets are self-correcting. We urge the investor to not do the wrong thing at the right time. Have strong hands. Do the right thing at the right time. The “self-correcting market” is the economic logic behind the old saying which is the title of this article: investors who are nervous or who are forced to sell are the ones who lose out, whereas the investors who can afford to buy during crises are the ones who pick up bargains.